Renovating your home can be very time consuming and stressful, especially if you try to do it yourself. That’s why it’s important to learn about practical changes and additions you can make and that you hire a professional to do them safely and correctly. These five projects are a great way to start your home renovation journey. Before you start this project, you must first decide if you want to modernize the room or create a more vintage look. This is especially important to keep in mind if you plan on selling your home in the near future, as not all potential buyers will share your specific taste. The answer will help you determine which style of tub, sink, tile, and fixtures you should upgrade with. The first thing guests or potential buyers see when they look at your home are your doors and windows. If they are showing signs of aging, like crack, breaks, and corroded hardware, getting them professionally replaced is a solid investment. 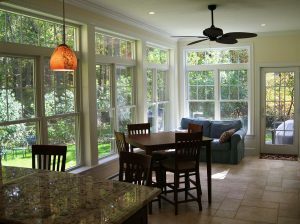 Not only will these additions improve your home’s overall aesthetic, it will help keep utility costs low and you safe. It can be easy to fall into an aesthetic rut when you have the same furniture as when you originally moved in. Now that other areas of your home have different styles, you can update your furniture to match or complement them. A small-scale kitchen remodeling project can do wonders for your home. When you redo the floors, add a new backsplash, refinish your counters and cabinets, and upgrade your appliances, your entire home will feel fresh and new. An outdoor space can really make a house feel whole, especially if you’re appealing to potential homebuyers. When you have a patio or deck professionally installed, you’ll be amazed at how these simple additions can really transform a space. Now that you know five practical changes and additions to upgrade your home, contact a skilled and trained licensed professional and get started today.